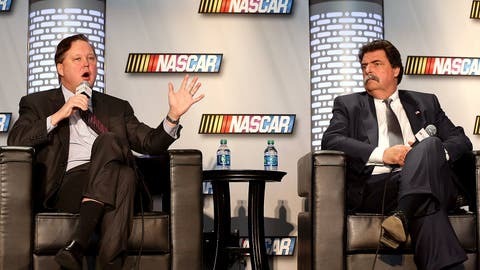 NASCAR chairman Brian France (left), pictured here with NASCAR president Mike Helton (right), seems intent on introducing changes to the Chase. The changes reportedly would expand the Chase field from 12 to 16 drivers and put more emphasis on winning races. Under the proposed new format, a win in the season’s first 26 races would almost guarantee a spot in the Chase. If the total number of winners exceeded 16, the 16 drivers with the most wins and highest point totals would earn playoff spots.